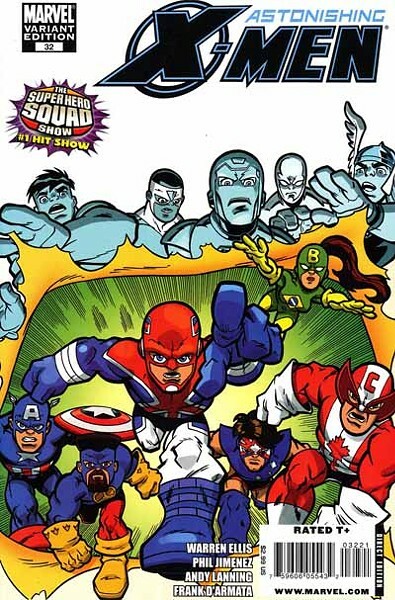 Published by Marvel Comics. Written by Warren Ellis. Pencils by Phil Jimenez. Inks by Andy Lanning. If -- like me -- you weren't blown away by Warren Ellis' first arc on Astonishing X-Men, then you'll probably love his brand-new story line, which marches on in issue 32. Last go-round, Ellis populated his scripts with tons of exposition and dialogue about outlandish pseudo-science crap. Fortunately, for this latest X-adventure, he's chucked a good portion of that babbling and replaced it with copious amounts of action (such as Wolverine chopping up alien creatures and Emma Frost getting smacked through a trolley car). That's not to say that all the big ideas are on the cutting-room floor; be on the lookout, for example, for giant morphing Sentinels made out of flesh and bone (instead of, you know, metal) who also have the ability to shoot Brood creatures from their fingers (yes, it's very weird). It's just that Ellis is showing us what's happening here rather than telling us. That said, 50 percent of the success of this book has got to go to new Astonishing artist Phil Jimenez, who packs his pages with oodles of kinetic energy and pretty-as-hell "widescreen" illustrations. Jimenez has come a long way from his days as a clone of George Perez -- he now can stand on his own as one of the most talented dudes in the industry.